Welcome to another video tutorial. 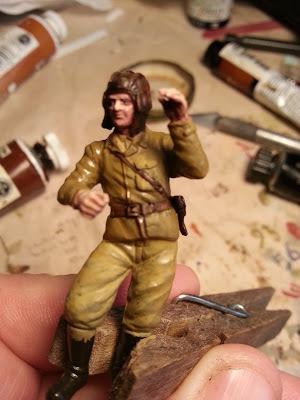 This time I’m showing you how to paint leather in 1/35 scale, using oil paints. This can be used for leather belts, leather holsters, leather satchels, leather helmets, leather coats and all other sorts of stuff you would encounter when modelling 1/35 military figures. My subject today is the Soviet tank crew member who came with my Tamiya SU-122 self propelled assault gun kit. It’s a basic old 1980s figure, it doesn’t have the beautiful moulding you would expect from a modern kit (let alone one of the fancy-pants expensive resin figures available now). But it does fit the kit perfectly, most importantly around the raised hatch and his arm rests perfectly on top of the tank. Plus I like to challenge myself and see just what I can do with older models. Using oil paints isn’t intimidating. When I first started I thought oil paints were only for artists, that drying times would be a nightmare, that paints and thinners and drying mediums would be expensive – all that sort of stuff. Nope. You can pick up oil paints cheap at your local dollar store, and the cheap tubes will do the job just fine. Slower drying time is actually your friend when it comes to painting leather, you want to be able to blend the colours and get nice gradations of tone. I don’t use any fancy materials like specialised thinners, I just use the normal stuff I use with enamel paints. 4. Highlight with Yellow Ochre, but be restrained here! If you don't like it, wipe it off. Remember, slow drying is your friend here. 5. 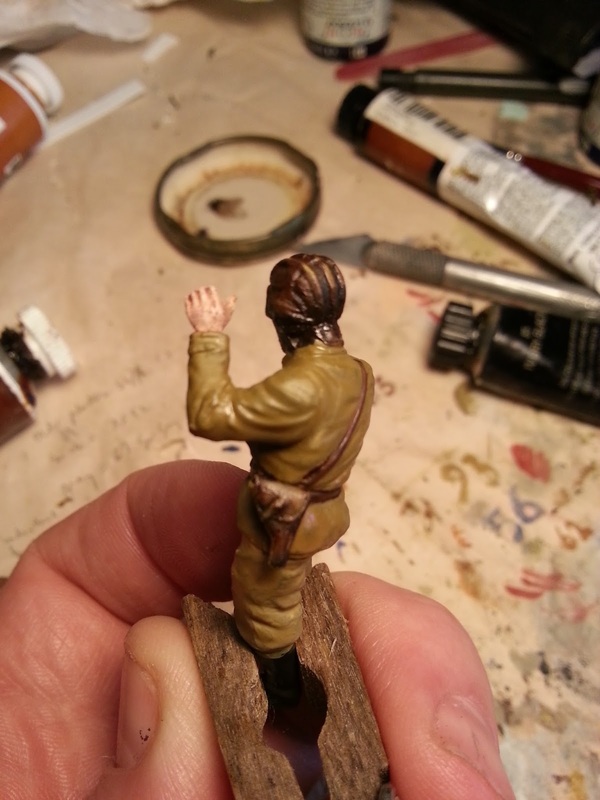 A final little touch up with Vandyke Brown again to bring out details. So give it a try. It’s a lot like painting with enamels, but you have more working time and you can really blend the colours like a pro. Explore, experiment, enjoy! Leather tank crew helmet and leather holster. Leather belt and shoulder belt.